The third Kingdom of Avalon hero with 3 AP costs 40 pts. 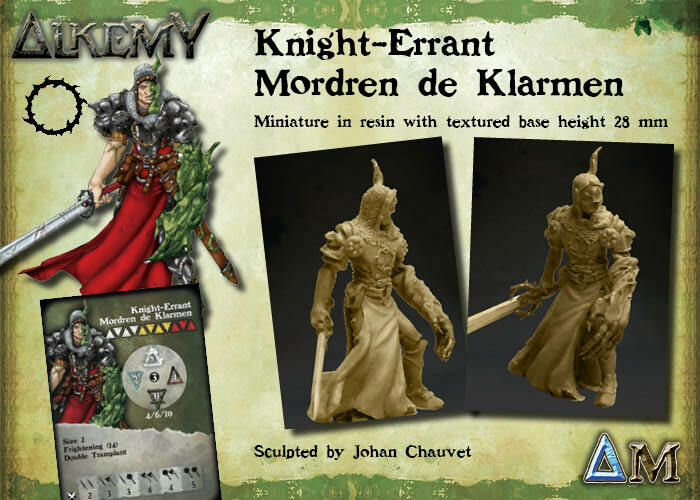 Mordren de Klarmen is more versatile than the other heroes. Mordren has neither the violence of Lotharius nor the defense and nuisance abilities of Berac’h. Nevertheless, our knight has advantages. Indeed, he has the highest Mind, Reflex and Defense of the faction. He is an excellent leader for your Warband, even though he doesn’t have the Leader skill. He is not a heavy hitter, with a 4 Combat and low Damage table for an Avalonian. He is intended more to finish injured enemy miniatures. However, he is quite resistant, with his many Hit Points, Frightening (14) and 11 in DEF. The last big point is Mordren’s “Double Transplant” ability, allowing him to choose from four additional effects, single use and limited to one turn. Mordren can gain mobility (5/7/12 of movement), resistance (Tough (1)) or hinder the enemy miniatures that he will hurt, either by hampering their movement, or greatly lowering their COM value. Thus, Mordren has strong adaptability, allowing him to respond better to lists and adverse actions. List 1: Knight-Errant Mordren de Klarmen, Countryside Priest, 1 Avalonian Crossbowmen, Knight-Errant, 1 Avalonian Retiarus, 3 Avalonian Bushwhackers. This list is strongly focused on mobility and resistance. Mordren and the knight-Errant supported by the countryside Priest can be very hard to take down, while the Bushwhackers offers important mobility, to quickly take objectives. Conversely, the whole of the Warband can move quickly with 4 miniatures with 5/7/12 in Movement (Bushwhackers and Mordren), the Knight-Errant benefiting from the Religious Authority of the Countryside Priest who offers him a fourth AP and finally the Priest himself. The Bushwhackers can be replaced by recruits for a little more punch. List 2: Knight-Errant Mordren de Klarmen, Countryside Priest, 2 Avalonian Retiarus, 1 Avalonian Colossus. This list is focused on the multiple Frightening skills of the Warband. Indeed, with four out of five miniatures having Frightening, this Warband counts on the multiple penalty dice it can inflict on the enemy. However, this is a thematic list, which, despite the Frightening skill and the high HP of the miniatures, has only 5 miniatures and only 13 AP, which is low. We must play cautiously to win.